← Stepping Into the Unknown & Celebrating Change! Navaratri means nine nights, from navam, नवम्, nine, and ratri, रात्रि, night, in Sanskrit. This festival is celebrated twice each year, in the Autumn and the Spring. In Spring Navaratri begins when the Moon enters the Nakshatra Ashwini at 0° in Mesha/Aries in the Sidereal Zodiac (Vedic Astrology/Jyotisha). Autumn Navararti begins when the Moon enters the Nakshatra Chitra at 23°20′ in Virgo/Kanya. For my location on the west coast of the US, this transit of the Moon occurs at 7:11 am tomorrow September 25th. Navaratri is a celebration to honor the Divine Mother/Shakti. The nine nights can be broken down to honor the nine names of the Divine Mother in the form of Durga, but more commonly Navaratri is celebrated by breaking down the nine nights into three nights of devotion to the three emanations of Shakti – Kali/Durga, the fierce goddess of time, death, and destruction; Lakshmi – goddess of wealth, prosperity, and fortune; and Saraswati – goddess of knowledge, wisdom, and nature. The trinity of goddesses, the divine feminine energies, work with the divine masculine energies, the trinity of Shiva, Vishnu, and Brahma, in the continuous cycles of the Universe. The first three nights of Navaratri are dedicated to Kali. During this time we (women and men) can focus on cleansing and clearing out of our lives, including our bodies and minds, that which does not serve us. These are nights to break down, deconstruct, purify/cleanse, and set the stage for reconstruction for what we wish to bring into our lives. The second three nights are dedicated to Lakshmi. During this time we focus on that which we wish to preserve and keep in our lives. These nights are a great time to focus on expressing gratitude and appreciation for all the physical/material, emotional, mental, and spiritual abundance that our lives have been blessed with. The third three nights are dedicated to Sawaswati. During this time we open our hearts and souls to receive the Divine Mother’s guidance, now and into the future, as we build upon our actions and preparations of the previous six nights. This year Navaratri happens to coincide with the Jewish New Year celebration, Rosh Hashanah, and with the Day of Atonement, Yom Kippur. To learn more about these religious celebrations, see post on Rosh Hashanah and Yom Kippur here. Happy New Year and Happy Autumn to All! Most religions, whether monotheistic or polytheistic, have a figure who represents the Divine Mother and Mother Earth, such as Gaia, the Virgin Mary, Frigg, Demeter, Tara, Pachamama, Isis, Prakriti, and Shakti. Ancestral spirits, the souls of mothers, grandmothers, etc. 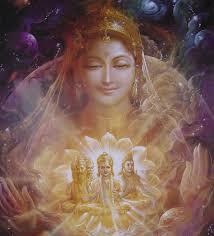 who have past, can also represent the Divine Mother. The Divine Mother represents the the creative force of the Universe and on the mundane level, the creative force of motherhood and nature. The Divine Mother nourishes and sustains life. She is the cosmic mother of time and space, the dynamic action of the Divine Oneness. She is an aspect of and the creative force of the Divine Oneness manifesting as Nature and Life. This entry was posted in Religions & Philosophies and tagged divine mother, feminine, goddesses, Hinduism, mantra, moon, nakshatra, Navaratri, Rosh Hashanah, San Francisco astrologer, Shakti, trinity, Yom Kippur. Bookmark the permalink. Namaste, this is a decent interpretation of the Hindu festival and I love seeing the knowledge shared. Hinduism is often mistaken as a polytheistic religion, but it is actually monotheistic. The ‘gods’ and ‘goddesses’ are essentially avatars of the one Devine, assisting in understanding such a vast being, by it’s many characteristics. Mother Lakshmi is often mistaken as the goddess of ‘wealth’, but as my mama and papa explained, it is not traditionally of monetary wealth, but to remind people of the wealth of love, kindness, compassion, etc. The wealth of caring, that she affords as the Devine Mother. The things that are truly of value. It has unfortunately been morphed over time to what people crave, or value now, financial security, which is unfortunate. Thank you for this post, and the effort you put into sharing it.<3 Shakti-Shaman. Thank you for a very informative posting. This is lovely. It’s amazing how the collective informs each of us. I’ve been hearing Ave Maria in my dreams and at times during the day for several weeks, now… and reading about the Black Madonna on Seven Minds. Reading your post just stopped me… listening to the mantra while reading the last of your post was a lesson in spontaneous meditation. Very beautiful. Happy Navratri Celebration, Julie! This is a wonderful time of the year 🙂 Welcome Goddess! So informative and timely post!! Loved this….